1. Place the tomatoes, red onions and basil leaves in a bowl. 2. Drizzle over the olive oil. 5. Arange the arugula leaves on a plate. 6. Drizzle more olive oil and vinegar. 7. Sprinkle some salt and pepper powder. 8. Add the tomato mixture. 9. Scatter the mozzarella and basil leaves. 10. Drizzle some more olive oil and vinegar. 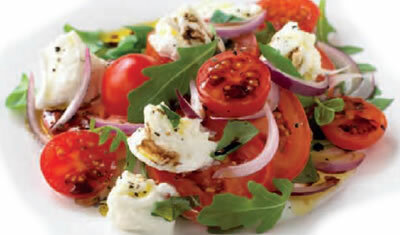 Feel free to comment or share your thoughts on this Tomato, Red Onion and Mozzarella Salad Recipe from Awesome Cuisine.